For great information for the horse owner on all sorts of topics, The Horse magazine is our favorite "go-to" source. 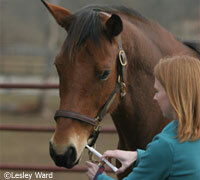 It's published by the American Association of Equine Practitioners (AAEP) and comes out monthly. Their website is www.thehorse.com which features articles on horse husbandry, horse welfare, the economics of horse ownership, and what's going on in the academic world with relation to equine medicine. We highly recommend it! Why do horses sometimes eat weird things?